The plant featured today is Spiraea thunbergii. It is one of my favourite flowering shrubs because of its delicate spring flowers and interesting foliage. Spiraea thunbergii grows up to 5 feet as a dense, twiggy shrub and produces attractive narrow leaves. 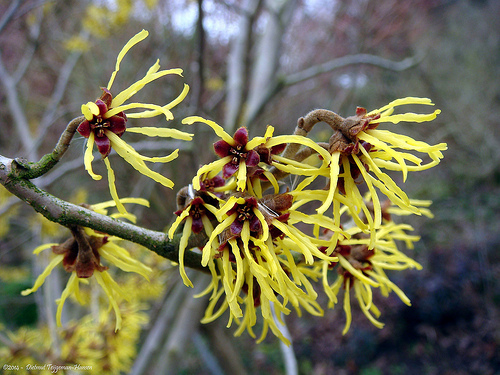 The beautiful foliage grows on wiry stems that densely branch out from the main stem of the plant. The interesting formation of leaves gets more beautiful in fall when the green color of leaves turns to golden-yellow to orange and bronze. The leaves fall of in winter and start sprouting again in early spring. Flowering starts in spring and last for many weeks. 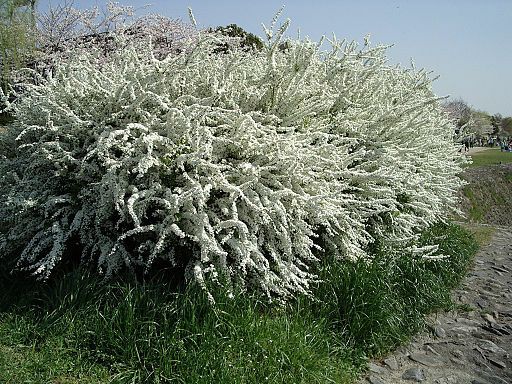 The white delicate flowers of Spiraea thunbergii form small clusters that cover the entire plant. 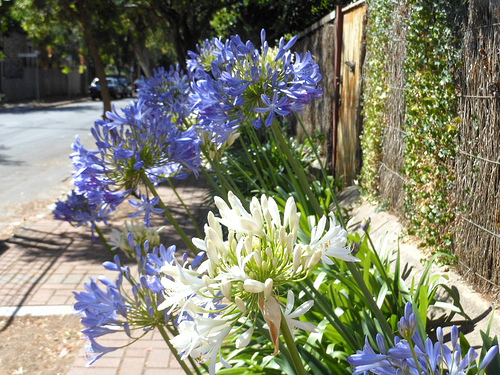 Exposure to full sun encourages growth of flowers. Because of its interesting foliage, beautiful flowers and growing habits, Spiraea thunbergii makes an excellent border plant for gardens and landscapes. Spiraea thunbergii can be easily grown in a slightly moist but well-drained soil. This lovely shrub loves sun but tolerates light shade. As with most plants in the Rose family, propagation of Spiraea thunbergii is done from layering or cuttings. Liriodendron tulipifera, commonly known as Tulip Tree or sometimes as Yellow Poplar, is a tall and deciduous flowering tree from North America. 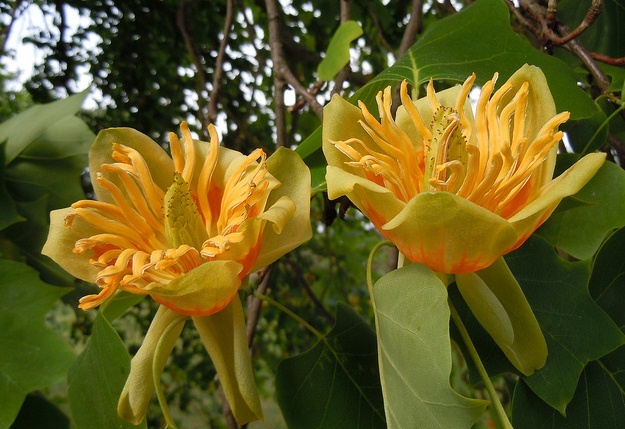 Characterized by its height and beautiful flowers, Liriodendron tulipifera makes an excellent flowering tree for gardens and landscapes. With a rapid growth rate, the tree can gain the height of up to 150 feet or more in wild. However, it takes much time to reach that height (An old Tulip Tree in Queens area in New York measures 134 feet; it is said to be 400-450 years old and often described the oldest living thing in New York. The tree is named Queens Giant). In cultivation, it can grow as tall as 70 to 100 feet. Like most plants in the Magnolia family, Liriodendron tulipifera is a valuable plant in horticulture. It has broad, glossy green leaves that turn to golden in autumn. 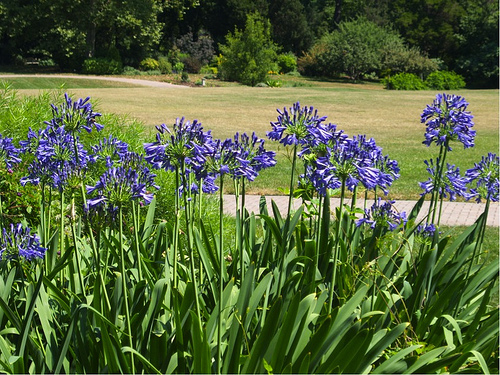 Large tulip-like, cup-shaped flowers appear in spring to add to the grandeur of the tree. Flowers are predominantly greenish-yellow with dashes of red and orange. It does not branch much and tends to form columnar growth which makes it a good source of fine-grained timber. Liriodendron tulipifera prefers bright sunlight, and a rich and moist soil. The tree can be propagated from seeds. Young plants should be grown under partial sun and later moved to direct sunlight. 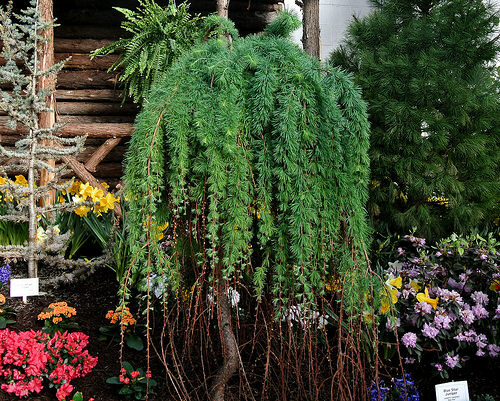 Young plants have deep and fleshy roots that are easily broken if handled roughly. 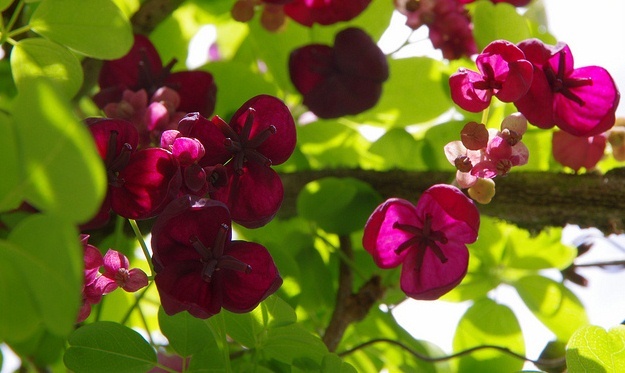 Akebia quinata, popularly known as Chocolate Vine because of its brownish-purple flowers, is a beautiful climber for sunny or partially shaded spots in gardens. Native to the Far East, Akebia quinata grows as a quick climber and makes an excellent specimen for growing over pergolas or against walls where it produces abundance of fresh-green foliage. It can also be used as ground cover. The compound leaves of Akebia quinata are evergreen in tropical climates and semi-evergreen in colder areas. Akebia quinata grows in a slightly moist soil under full or partial sun. 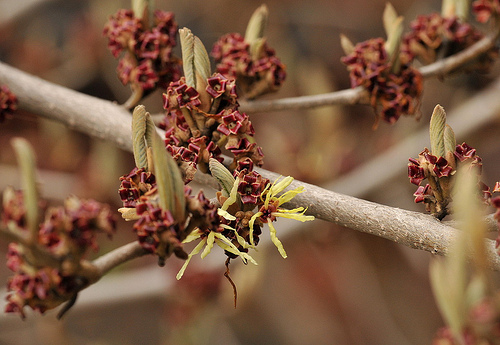 The chocolaty flowers appear in spring or summer and emit exotic spicy fragrance with the hint of vanilla. Flowers last longer in warm and dry conditions. Flowering is followed by formation of long pulpy and edible fruits. However, it usually requires two plants of Akebia quinata to fertilize the flowers. The plant can be pruned back at the end of the flowering season. The fruit as well as the plant itself are used in traditional Chinese medicine for their diuretic properties. Like most Akebias, Chocolate Vine can be grown from seeds sown in spring, or by layering long stems in winter. Symphoricarpos is a genus of deciduous shrubs known for their beautiful berry-like white fruit. Originally native to North America, these hardy shrubs can be grown in many different climatic conditions. Most species of Symphoricarpos prefer full to partial sun, average watering and almost any type of soil that does not retain water. From more than 15 species, Symphoricarpos albus is the one that is widely known and cultivated for its beautiful foliage and white berry-like fruit. The plant grows up to 5 feet and spreads vigorously across 6 feet or more. Cultivated from seeds or suckers, Symphoricarpos albus best performs when grown in partial sun and pruned regularly. The pinkish-white flowers of Symphoricarpos albus are quite insignificant but are followed by formation of large clusters of white berries in winter. These clusters of white berries add to the beauty of the plant in winter when it sheds most of its leaves. Symphoricarpos albus is capable of resisting frost and survive long spells of winter. The plant can be used in hedges and borders as a low-maintenance shrub. 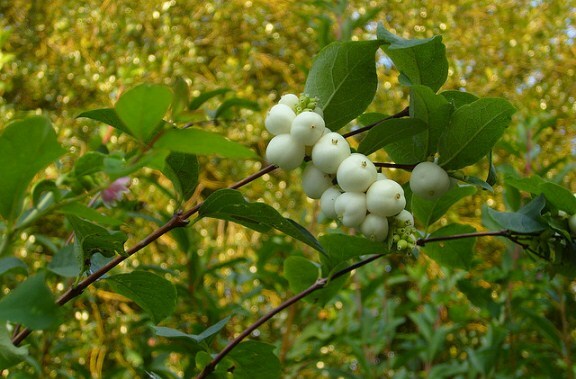 Common names of Symphoricarpos albus include Snowberry and Waxberry. Pachypodium is a genus of caudiciform succulents from the family of Plumeria. The plants in this genus are characterized by thick, succulent stems that are usually covered by long spines and crowned by lance-shaped leaves that are arranged in a circular fashion. Belonging to Africa and Madagascar, Pachypodium are quite hardy plants that can adapt to a variety of growing conditions in tropical and sub-tropical climates. Pachypodium offers a variety of unusual yet attractive plants of different sizes (as small as a few inches and as tall as 4 meters or even more). Since these plants originate from hot and dry climates, they are a good choice for designing low maintenance landscapes such as rock gardens and xeriscapes where they can store sufficient amount of water in their succulents stems to survive long spells of drought. In fact, the name ‘Pachypodium’ (pachy- podium/thick-footed) is derived from their habit of forming thick and succulent stems. From a number of commercially grown species, Pachypodium lamerei is the most popular and widely cultivated in landscapes and gardens. It is fairly easy to grown both indoors and outdoors where it receives sufficient exposure to sunlight and moderate water except in winter. It is cold sensitive and needs to be protected from frost, overwatering and freezing temperatures in winter. 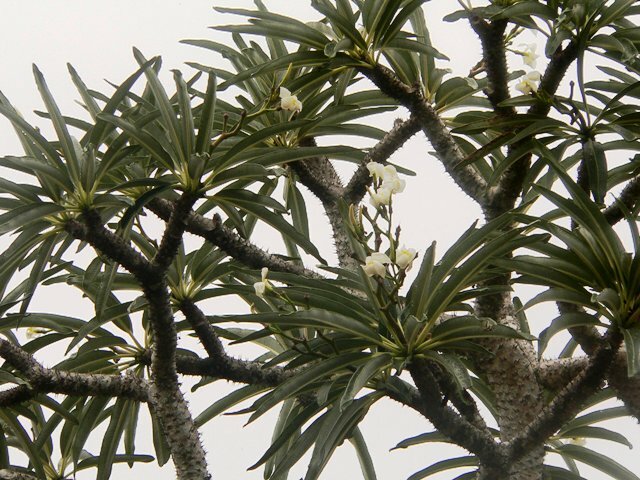 Though it is not a palm but Pachypodium lamerei is commonly described as Madagascar Plam – may be for its rich green leaves that crown the tall succulent stem of the plant. These leaves usually pale out and fall in winter followed by new growth in spring. 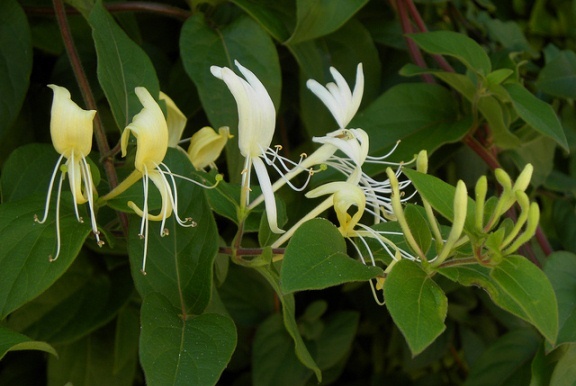 This is the time when the plant produces showy white or yellow fragrant flowers. However, it takes a lot of years (up to 10 years) to start blooming. At this stage, the plant reaches the height of 3 meters or more. Pachypodium lamerei can be propagated from seeds, divisions or grafting. The plant prefers a regular but well-drained soil mix. Pachypodium geayi: Similar to P. lamerei with thicker stems. Tends to branch out and grow up t0 m meters or more. White flowers often appear on branches. Pachypodium horombense: Grows as a small succulent shrublet and produces a swollen tuberous stem with spiny branches each bearing a rosette of leaves. Average height is 1 meter. Flowers appear in early summer. 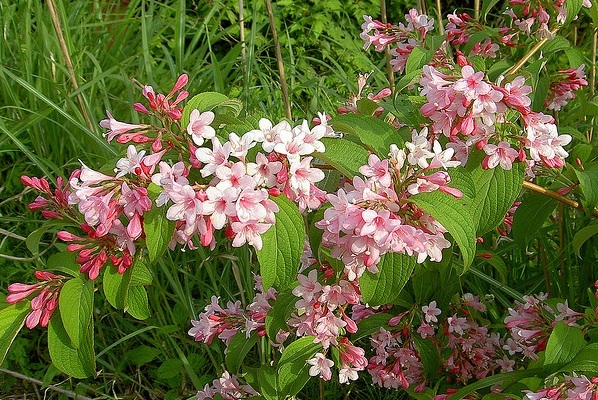 Weigela is a small genus of deciduous and summer flowering shrubs from eastern Asia particularly from China and Korea . These hardy and easy-to-maintain shrubs makes excellent accent plants for gardens and landscapes because of their lovely foliage and flowers. Most species of Weigela are frost hardy and can also withstand drought and heat, thus, making a good choice for garden hedges or mix borders. Propagated from cuttings, Weigela grows quite quickly and requires regular pruning after every flowering season. The plant usually has a long flowering season that starts in late spring and continues till the mid of summer. The flowers of white, pink or red colors are quite showy and attract birds and butterflies. Ideal growing conditions for Weigela are a sunny or semi-shaded spot, well-drained soil, lightly alkaline medium, and average moisture. Weigela florida ‘Candida’: Popular variety with bright-green leaves and beautiful white flowers. W. florida ‘Polka’: Profuse bloomer with deep-pink flowers in spring and summer. W. florida ‘Variegata’: Perhaps the most popular variety with compact and mound-forming habit; green leaves with white margins. Flowers are rose-pink. W. florida ‘White Knight’: Compact shrub with white flowers throughout the summer.